The aim of the present study was to ascertain a comparison study of the expressed values of madrassa background and general background students to the Dhaka University. In order to attain this purpose two random samples, one consisted of 25 male Madrassa background 1st year students of Dhaka University and another consisted of 25 male general background 1st year students of Dhaka University. An adapted Bangali version of “Allport-Vernon-Lindzey study of values” was used in a quite and calm environment to measure theoretical, economic, aesthetic, social, political and religious values of these students. The obtained datas were subjected to t-test and the analysis of the results indicates that the value of social and religious values were significant but the values of t for theoretical, economic, aesthetic and political values were not significant. The findings indicate that madrassa background 1st year students of Dhaka University are more societal and religious then general background 1st year students of Dhaka University. No significant differences exist between madrassa background students and general background students in theoretical, aesthetic, economic and political values. A value constitutes one of the several factors that should be taken into account if one seeks to predict and understand human behavior. The term values also refer to belief as to what is desirable or good and what is undesirable or bad; what is important ad what is unimportant; what is worth while, interesting and worth doing and what is useless, boring and not worth doing. Values reflect the culture of a society ad are widely shared by the members of the culture. A man and the culture of his society can be known by knowing his values. The concept of “value” has been defined by different researchers in different ways. According to williams (1995), “values are often considered to be wholly personal affair, a creation of individual or collective desires and preferences”. In this way, values have been reduced to mere a expression of personal sentiment, like the subjective preference a person may have for one colour over another, on one game over another game. Others consider values to have an element of stability and objectivity. This allows them to be qualified as good or bad, deeper or shallow. superior or in fierier value can also be described as learned beliefs. Rokeach (1973), Individual learn them from their culture in general and more specifically from their family, religion, peers, educators and experiences. Afroze and Chowdhury (1990), wrote that although the uniqueness of an individual is one of the most fundamental characteristic facts of life, is individual’s attitudes, interests, values etc, are determined by the society to which he belongs. 1. The theoretical: The theoretical according to him is characterized by a dominant interest in the discovery of truth and by an empirical, critical, rational, “Intellectual” approach. His main aim in life is to order and systematize knowledge. 2. The economic: The economic man is characteristically interested in useful and practical values. His chief aim in life is business, production, marketing and consumption of goods, the elaborations of credit and the accumulation of tangible wealth. 3. The aesthetic: The aesthetic man places the highest value on form and harmony; Judge and enjoys each unique experience form the stand point of its grace, symmetry or fitness. 4. The social: The social man regards love as if self the only suitable form of human relationship. He prizes other persons as ends and therefore himself kind and on selfish. 5. The political: The political man is interested primarily in personal power, influence and renown not necessity limited to the narrow field of polities. 6. The religious: The religious man is mystical. He has dominant interest in what is divine in every phenomenon. A given man may belong to any number of these types of values and the relative prominence of these values differ in him. Values are moral or professional standards of behavior and are a function of age, time, social influences and also education system. There are two kind education systems in Bangladesh. One is general education and other is madrassa education which may influence human value, in different lines. Though the theoretical values are the same between general and madrassa students but may emphasizes on Islamic education and imparts cultural. Other hand, general students emphasizes on secular education profane education, madrassa students are also more religious than general students. They are expected to have more interest in what is divine in every phenomenon then general students because madrassa students take training about religious education but this type of job is not done by general students. Madrassa education trains all the learners in Islamic education and imparts culturel values based on the percepts of Islam. In Madrassah education, more emphasis is put on the main sources of Islamic learning. al-Quran and al-Sunnah. The aim of Islamic education is the creation of the good and rightenous men who men who worship Allah and mould or build up the structure of earthly life according to the doctrines and injunctions of Islam. Of course, more emphasis is put on Islamic education. The teaching of other subjects is treated as secondary in madrassa education but in general education these are treated as primary. Teaching of religious education is treated as secondary in general education system. Since in madrasha education more emphasis is given on religious values than in general education, so, it is expected that madrasha background student’s value system should be different from that of general background students. Madrasha background students are expected to be more religious than general background students. They are expected to have more interest in what is devine in every phenomenon than general background students because madrassa background education trains the learners in religious education, but this type of job is not done by general background education. An important point is that madrassa background education doesn’t train the learners keeping them tied to non-political issues rather together with religious interest they are also trained to develop political interest. Our everyday observations indicate that madrassa background students are politically active. Like general background students and madrassa background students are also concerned with the political atmospheres of the world and play active roles in the fields of politics. Again, madrassa background education and general background education both are concerned with human relationship in the form of love. They try to bring welfare to the mankind. The present investigation attempted to compare the values of madrassa background students and general background students to the 1st year of Dhaka University. 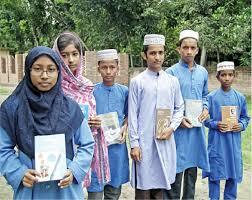 • Do any differ about six values of madrassa background and general background 1st year students of Dhaka University? 1. There would not be difference between theoretical values score of madrassa background and general background students of Dhaka University. 2. The mean economic score would differ between madrassa background students and general background students of Dhaka University. 3. The mean aesthetic value would not be difference between madrassa background and general background students of Dhaka University. 4. There would be difference in social value of madrassa background and general background students of Dhaka University. 5. There would be no difference in political value between madrassa background and general background of Dhaka University. 6. Madrassa background students of Dhaka University would yield higher men score on religious value than general background students. Two samples used in the current investigation. One consisted of 25 male madrassa background 1st year students of Dhaka University and the other consisted of 25 male genera background 1st year students of Dhaka University. The students of general background were selected at random from the University of Dhaka and the students of madrassa background students were selected by the same method. The mean age of both group students was 20 hears. The socio economic status of both groups ranged lower to higher middleclass. The samples were randomly selected from different faculty of Dhaka University. 27 students were arts faculty, 6 students were science faculty, 4 students were business studies faculty and 13 students were social science faculty. On the other hand, 15 students were resident and 35 students were non resident 1st year students of Dhaka University. An adapted Bengali version of “Allport-Vernon-Lindzey Study of Values” (Zaman, 1973) originally developed by Allport, Vernon and Lindzey (1960), was used for measuring six basic values: theoretical, economic, aesthetic, social, political and religious. The test is divided into two parts:part-1 and part-II. Part-I consists of 30 questions and Part-II consists of 15 questions. There are two alternative answers for each question in part-I and four alternative answers in Part-II and. In Part-I the testee’s task is to give a score of 2 to the more preferable answers and a score of 1 to less preferable answers. If any answer is not preferable at all, she/ he is to give it a score ‘o’ and its alternative a score of 3. IN Part-II, the testee’s task is to give a score of 4 to the first choices, a score of 3 to the second choices, a score of 2 to the third choices and a score of 1 to the fourth choices. The split-help reliabilities of the six scales range from .84 to .95 and retest after one month yields reliabilities between. 77 and .92 for the six scales (theoretical, economic, aesthetic, social, political and religious) and retest after two months yields reliabilities between .84 sand .93 for the same. These are the reliabilities of the English version of the scales. The validity of the original test was satisfactory. Moreover, high interjudge agreement was found between the Bangla version. and the English version of the scale. The sample had taken from Dhaka University at randomly. The students were made know that they were participating in a study concerned with a comparison of the expressed values of madrassa background and general background 1st year students of Dhaka University. They were assured that the information gathered from them would be kept confidential and be used only for research purpose. Then the booklets were distributed among the students and they wee asked to go carefully through the instructions printed on the coverage page the book let. All possible clarifications ere given to any difficulties in understanding the instructions and method of answering the questions. The students were discouraged form spending too long a time over the questions and encouraged to answer all book lets were collected from the respondents and they were given thanks for there sincere -co- operative. There was no time limit, but, most students required about 30 minutes to answer the questions in test. The same procedure was followed in collecting data from the students of the madrassa background students of Dhaka University. After completion of data collection scoring of the responses were done following the procedure provided in the manual of the test, Thus two sets of score were obtained for each value type (one set for madrassa background students and another set for general background 1st year students of Dhaka University. The aim of the present study was to investigate the effect of general background and madrassa background 1st Year Students of Dhaka University differences in basic areas of value system on, theoretical, economic, aesthetic, social, political and religious. Data covering these value types were collected from two random samples (one of general background and another of madrassa background 1st Year students of Dhaka University and were subjected to t-test. The analysis of results revealed that the mean theoretical value score of general background students ( g= 48.52) was not significantly greater than that of madrasha background students ( m= 45.84). The first hypothesis that there would be no difference between mean theoretical value score of madrassa background students and that of general background students was, therefore, supported by the finding. This result can be interpreted in that both group of students have more interest in the discovery of truth and have more empirical, and rational in applying their approach. In case of economic value, the mean score of general background students ( g=38.76) was not significantly greater than that of madrassa background students ( m= 36.68). The hypothesis that the mean economic score would differ between madrassa background students and general background students of Dhaka University was, therefore, not supported by the finding. It can be said that students of both groups are equally interested to embrace the practical affairs of the business world the production, marketing and consumption of goods, the elaboration of credit, and the accumulation of tangible wealth. In case of aesthetic value the mean score of general background students ( g=35.48) was not significantly greater than that of madrassa background students ( m=33.16). The hypothesis that no difference would exist in aesthetic value of general background students and madrassa background students was, supported by the finding. This result can be interpreted by saying that students of both groups have no dominant interest in aesthetic value. The both group of students have found their highest value in form and harmony. They are mainly interested in things which are co- herently and symmetry, or fitness. Beauty is the greatest truth to them. In case of social value, the mean score of madrassa background students ( m=42.04) was significantly grater than that of general background students ( g=39.12). The hypothesis that there would be no difference between madrassa background students and general background students in social value was, therefore, not supported by the finding. It can be said that madrassa background students are so kind and sympathetic to the people of the society than the general background students. In case of political value, no significant difference was found between the mean score of general background students ( g=41.88) and that of madrassa background students ( m=40.32) the hypothesis that there would be no difference between madrassa background students and general background students in political value in was, therefore, accepted. Here, it can be said that the students of both groups are equally interested in personal power, influence and renown. In case of religious value, madrassa background students yielded a significantly greater mean score ( m=42.12) than general background students ( g=34.88). The hypothesis that madrassa background students would yield higher mean score on religious value than general background students was supported by the finding. This finding can be interpreted in that madrassa background students have more dominant interested in what is divine in mystical than are general background students. They are more with the unity of all experience and seeks to comprehend the cosmos as a whole. In fine , it can be said that madrassa background and general background 1st year students of Dhaka University difference about values exist in 2 basic areas of value system such as social and religious while in 4 other basic areas of value system such as theoretical, political, aesthetic and economic no significant differences exist. So, finally can say that madrassa background students are more social and religious than general background 1st year students of Dhaka University. The present research was conducted basing on less number of subjects. It was conducted taking the subject from varies faculty of Dhaka University. Though the results support the hypothesis, yet, if subjects could be taken female then the results would be more represented and credible one. But the female subjects did not take for many problems. For this lack of taking female subjects, it was one of the limitations about the current investigation.